Daniel Podence lashed the Greeks ahead with seven minutes remaining after they had soaked up pressure. 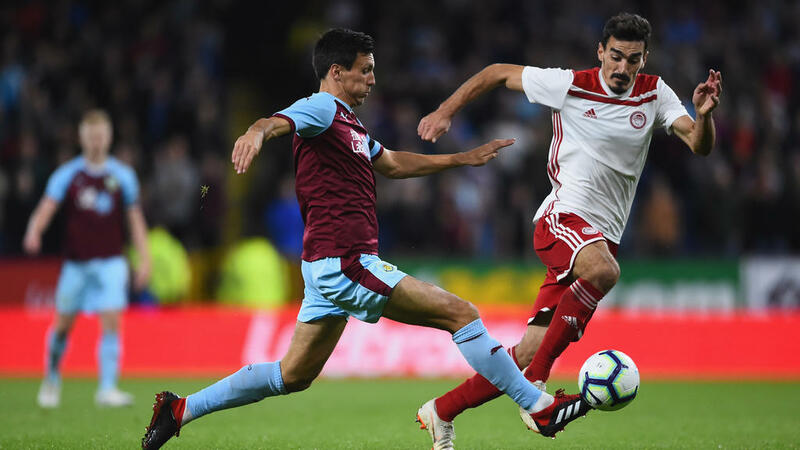 And although Matej Vydra poked home to level shortly after the restart that was as good as it got for Burnley, whose focus reverts sharply to the Premier League where they placed seventh last term. Rangers, managed by former Champions League winner Sveven Gerrard, enjoyed better fortunes among the British contingent when they advanced 2-1 on aggregate after holding Russian side FC Ufa to a 1-1 away draw despite ending the contest with nine men. Liverpool loanee Ovie Ejaria scored with a majestic strike for the Glaswegians, who lost Alfredo Morelos and Jon Flanagan to dismissals either side of the break. Celtic themselves also eased through a decade on from both Glasgow clubs competing on the Champions League stage -- in their case with something to spare as they saw off Lithuania's Suduva 3-0 at home. Having been knocked out of Champions League qualifying by AEK Athens the Scottish champions advanced with goals from Leigh Griffiths, Callum McGregor and Kristoffer Ajer for a 4-1 aggregate win.